I once did a New Times Weekly doubletruck on why I should be the publisher of the Arizona Republic (their publisher, Duke Tully, had just resigned over a false military medals scandal), and I warned everyone I would have a slightly different priority when it comes to what goes on the front page. Daily Whip Out: "Stop The Presses!" 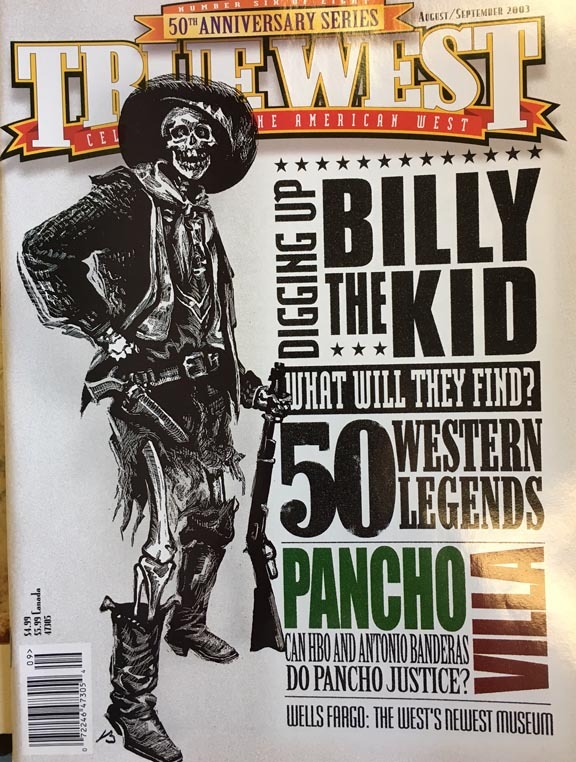 August 2003 cover of True West: "Digging Up Billy the Kid"
It sold like hotcakes. I happened to be in New York when this issue hit and I remember sitting on a couch in a Manhattan Barnes & Noble (at the time there were two B&N stores within sight of each other) and I watched with great interest—okay, with extreme glee!—as three different customers picked up the issue and walked to the checkout with this True West magazine in their little hands. Yes, that is my scratchboard of Billy as a bucktoothed skeleton. 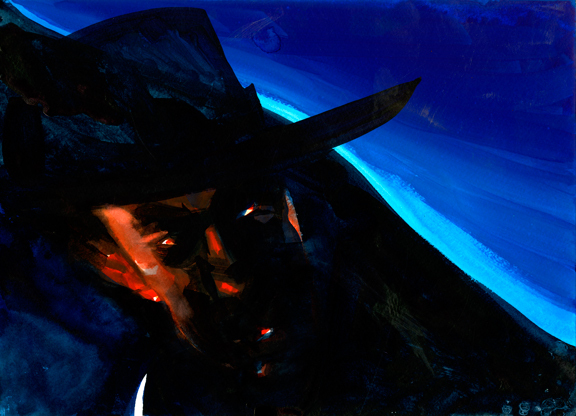 Got up at 5:30 today and finished a little nocturne study. Daily Whip Out: "Shadowy Character Study"
"Just the bare bones summary of a terrific story should move a listener to experience pity and fear." —Charles Johnson, "The Way of A Writer"